Dry the ribs with a paper towel then salt and pepper the Short Ribs on all sides and then dredge in Potato Starch. Shake off excess starch and set aside. Select Sauté/Browning and allow the pot to heat until hot (Instant pot will display Hot when hot enough) Add Olive Oil, and diced Pancetta sauté for 3 -4 minutes. Add in shallots, onions, garlic and carrots to the cooking pot and mix to coat with the oil & pancetta grease sauté for 5 minutes. Push aside the vegetables and place the ribs in the cooking pot beside the vegetables. To fit the ribs in the instant pot, you may have to put the vegetables on top of the ribs. Pour in Beef Broth. The liquid should almost reach the top of the ribs. Add more beef broth if necessary Place the Rosemary and Thyme sprigs on top. Lock the lid in place and ensure that the Pressure Valve is closed. Cook on high pressure for 45 minutes. When Beep sounds, let pressure release naturally and then remove the lid. Skim off fat off excess fat**** if using right away. *** If you do not have fresh herbs you can use a ¼ teaspoon dried Thyme and dried Rosemary. ****If making ahead you can place the Cooking Pot in the refrigerator for a few hours or overnight, so the fat will rise to the surface and harden, making it easier to remove. Short Ribs taste even better, the next day. Truly a one-pot meal. 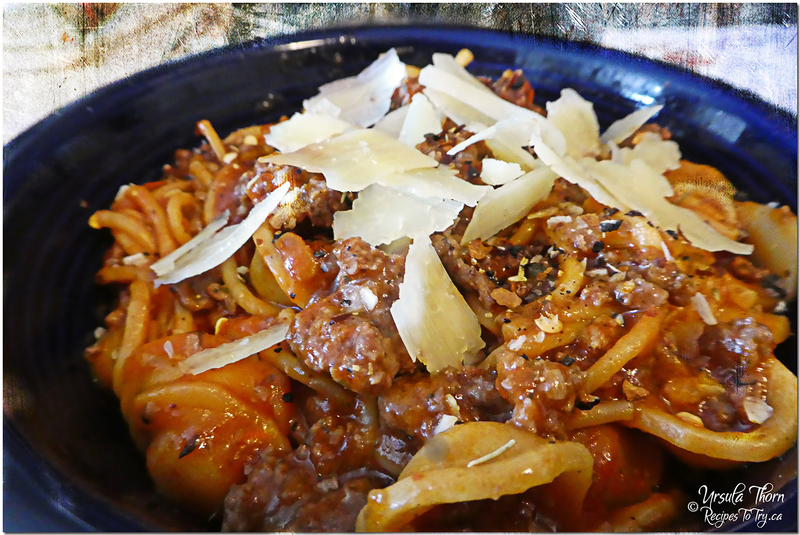 A delicious meat sauce over pasta. All ready in about 40 minutes. And no additional pots to clean. Select Sauté or Browning on your Pressure Cooker and allow it to heat. Add olive oil to the Pressure Cooker cooking pot and then dump in the beef and break into pieces as you brown. When meat is partially brown, add onions (and peppers, if using) and sauté until ground beef has browned. Add garlic and sauté one more minute. Drain excess grease, if needed. Add the rest of the sauce ingredients. Stir to mix. 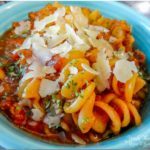 ( stop here if you only have a 3 qt mini instant pot and see notes****) Add the noodles. Set your Instant Pot to manual high pressure for 4 minutes. When the timer is up; carefully do a quick release. Take out bay leaves and give everything a good stir. This recipe is very forgiving if you can not find the cans in the appropriate amount choose the closest in size. 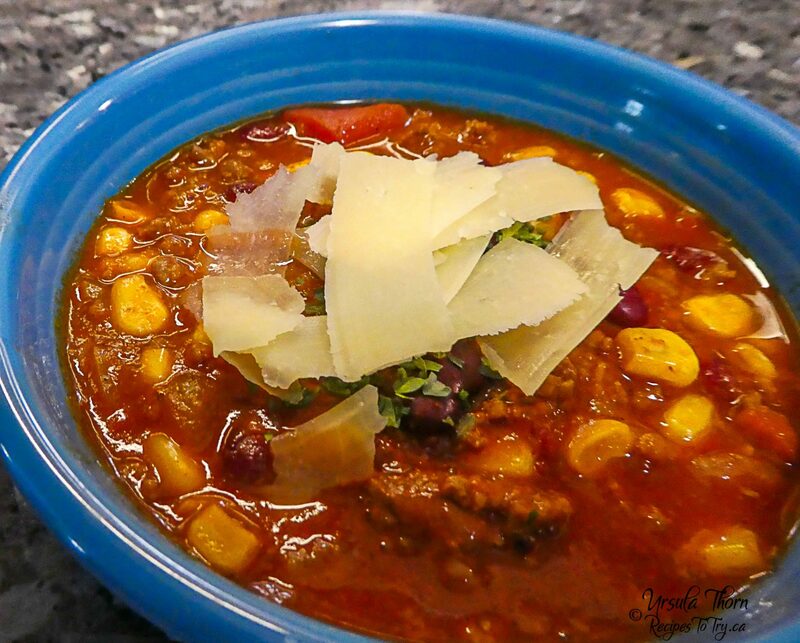 ****This recipe is for the 6-quart Instant Pot. 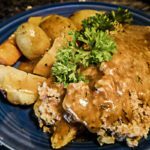 If you only have a 3 qt instant Pot (mini) just follow the recipe as stated. When you get to the point you are adding the noodles stop remove ½ the sauce and save for another time. Add half of the noodles (3 cups) and continue with the recipe. I freeze the extra sauce in a container that fits the instant pot with a Ziploc bag in the container. Place container and Ziploc bag in the freezer when the sauce is frozen remove the container and store the Ziploc bag for up to 3 months in the freezer. 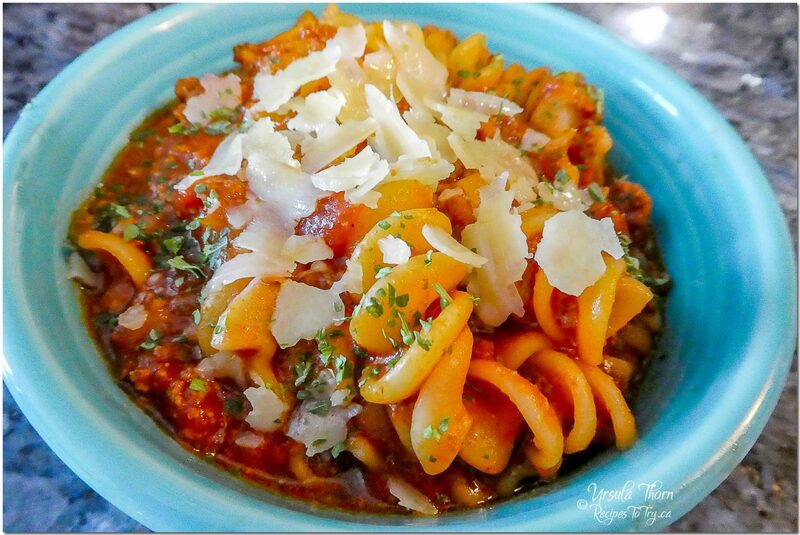 The idea is that the when you want to cook this recipe again just place the sauce in the instant pot add the 3 cups of noodles and set for pressure cooker 10 minutes. A lot less work then if you had to make the sauce again. An authentic and healthier version as it has less oil plus it is far less saucy than your typical Chinese restaurant version. 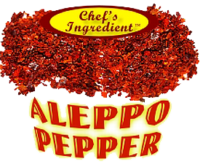 Heat oil in a wok or frying pan over high heat. Add the remaining ingredients and stir fry until the sauce is thickened. Serve immediately. 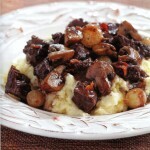 Beef Burgundy or Boeuf Bourguignon is so much more than just another beef stew. The savory aroma of onions, slow-cooked beef, and red wine is so fantastic and will make your kitchen smell of good food cooking. Make Boeuf Bourguignon once, and you'll wonder why anyone ever bothers making anything else. 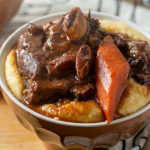 The stew reheats well and is one of those dishes that tastes even better the second or third day. Dry beef with paper towels and season with salt and pepper. 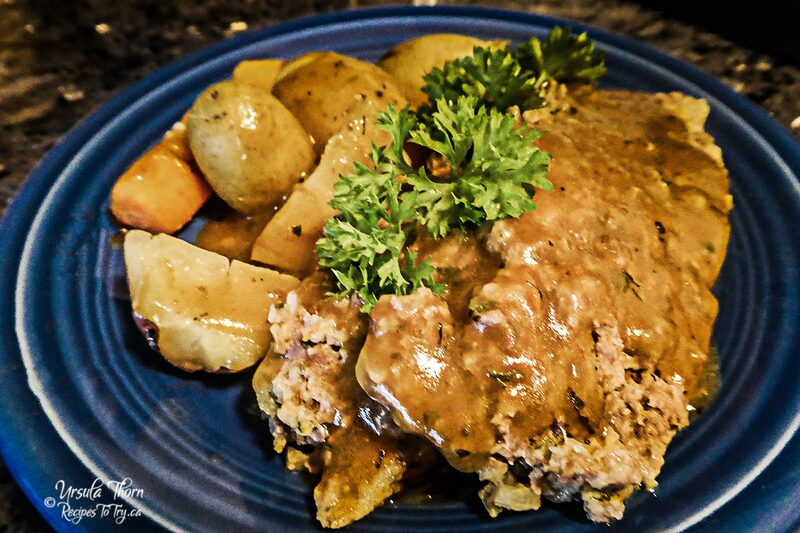 Place ½ of beef in slow cooker. Heat oil in 12-inch skillet over medium-high heat until just smoking. Brown remaining beef well on all sides, 7 to 10 minutes: transfer to slow cooker. Cook bacon in a skillet over medium-high heat until crisp, about 5 minutes. Stir in onions, carrot, tomato paste, garlic and thyme and cook until onions are softened and lightly browned. 8 to 10 minutes. Stir in flour and cook for 1 minute. Slowly whisk in 1¼ cups wine, scraping up any browned bits and smoothing out any lumps; transfer to slow cooker. Stirring the broth, soy sauce, and bay leaves into slow cooker. Cover and cook until beef is tender. 9-11 hours on low or 5 to 7 hours on high. About 20 minutes before serving, bring pearl onions, water, butter and sugar to boil in 12-inch skillet. Reduce to a simmer, cover and cook until onions are fully thawed and tender, 5 to 8 minutes. Uncover, bring to a boil and cook until all liquid evaporates, 3 to 4 minutes. 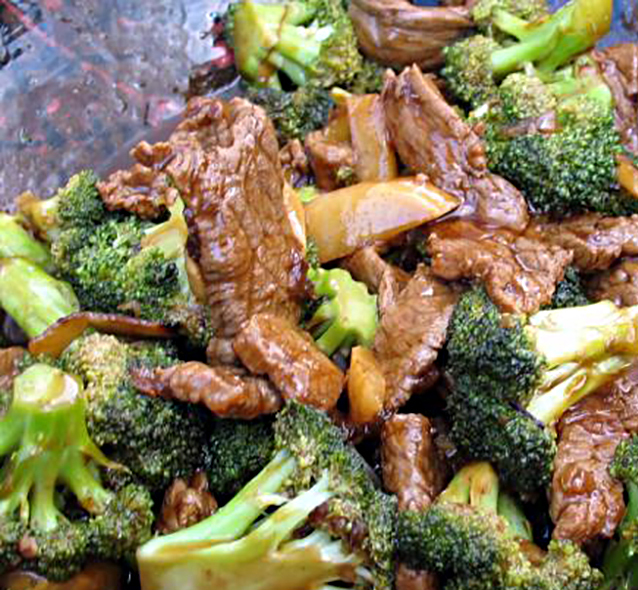 Stir in mushrooms and cook until vegetables are b owned and glazed. 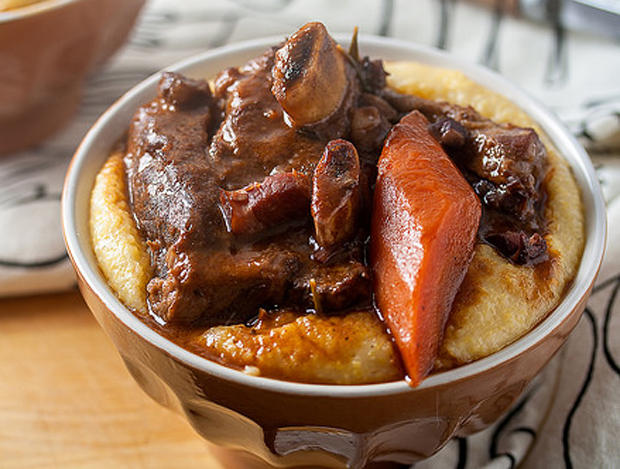 8 to 12 minutes; transfer to slow cooker. Serve over mashed potatoes or noodles. 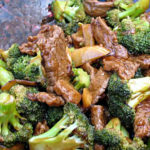 Make sure you cut the beef into at least 1-inch chunks as a smaller size will disincarnate during the long cooking process. 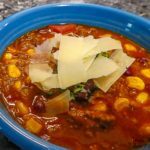 The stew reheats well and is one of those dishes that tastes even better the second or third day. The gravy base of the stew is boosted; by browning half of the meat and by sautéing bacon with a hefty amount of garlic and thyme and adding tomato paste for sweetness and soy sauce for extra meatiness. To keep the flavor to the wine in balance half of it is added at the onset and then the remaining half is reduced to mellow its sharpness before adding it the at the end. The onions and mushrooms are added at the end to prevent these vegetables from over cooking and becoming soggy. There is a lot of extra prep time, but it is worth it to ensure that this a rich tasting company worth beef burgundy. 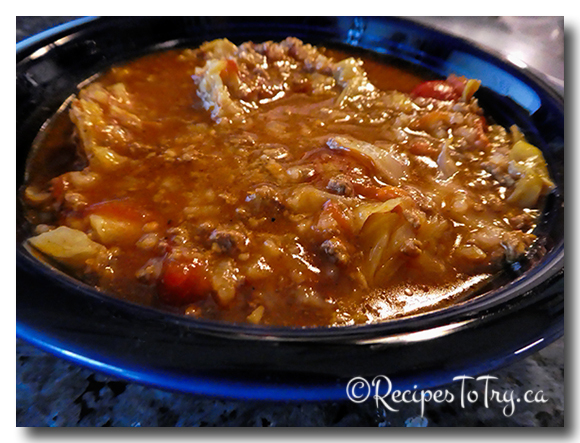 Cabbage Roll Soup is the perfect way to enjoy cabbage rolls without all of the work! 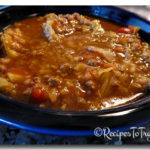 a rich and hearty soup loaded with cabbage, meat & rice; perfect for a winter or fall evening! This soup comes out very thick, almost stew-like, if you prefer a more soupy consistency, you can add more broth. the leftovers) are amazing! 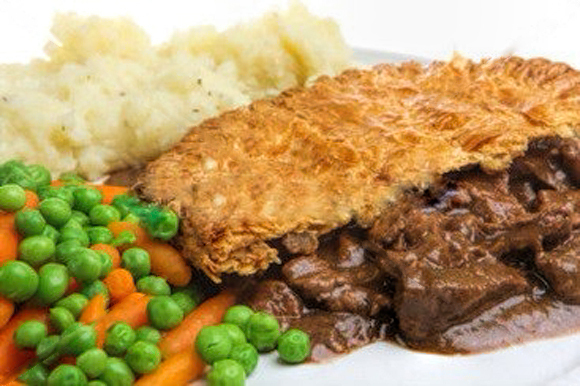 This is very tasty even though the name is a misnomer as the pie does not use steak but a cheaper cut of meat. 1 package Tenderflake Puff Pastry (397 gm. boxed) used only half thawed. Cook the 6 chopped slices of bacon in a Dutch oven over medium high heat until crisp. Remove the bacon and place on paper towel. Mix the ½ cup of flour, ½ tsp. salt, and ½ tsp. Pepper in a large bag and shake to mix. Place the beef and kidney in the bag and shake again to coat all the meat with the flour mixture. Brown the beef and kidney in the bacon fat in the Dutch oven over medium high heat. About 10 to 15 minutes. Remove the browned meat and place in bowl and set aside. Add the onion, grated carrot, and sliced mushrooms to the Dutch oven add olive oil if not enough bacon grease remaining. Cook until soft about 8 minutes. Add garlic and cook another minute. Add the Beef stock and wine to the vegetable mixture and scrap the bottom of the bottom to lift all the browned bits. Add Worcestershire sauce, thyme, mustard, tomato paste and stir to mix. Add the beef and kidney and bacon bits into the pot. Heat to simmering. Cover and place in 325 degree F oven for 2 to 3 hours until beef is tender. Roll out puff pastry in a large rectangle. Cut into 6 smaller rectangles. After the beef and kidney is done remove from oven. Turn up the oven to . Place the Beef and Kidney mixture into 6 Aluminum Foil ware containers. and cover with the puff pastry rectangles. The puff pastry rectangles do not have to fit exactly. Brush the pastry with the beaten egg or could just bake the puff pastry rectangles separately on a cookie sheet. 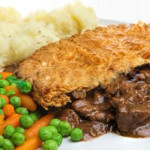 This would be better if you plan on freezing some of the Beef and Kidney pies as it will avoid the puff pastry from getting to soggy. Put the containers on a cookie sheet and bake in the oven for about 30 minutes. If you wish to freeze this. Remove the pastry puffs from the beef and kidney pie and cover the container with the lid that came with the foil ware containers. Place the puff pastry on top of the lid and cover with plastic wrap before freezing. 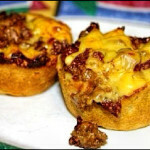 These cheeseburger biscuit minis are incredibly easy to make. A tasty and delicious snack. 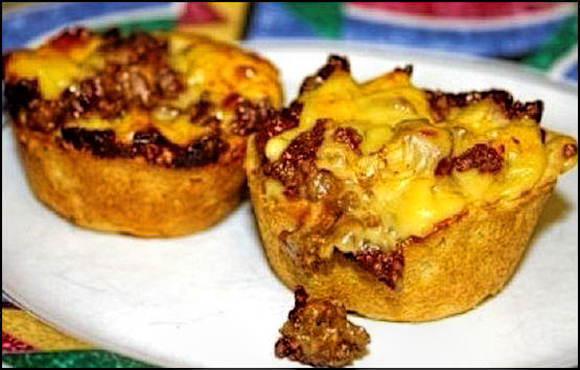 Simply press biscuit dough into muffin-pan cups and fill with a tasty ground beef mixture and bake until golden. 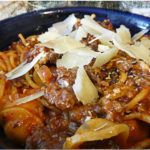 In a large skillet, sprayed with non-stick oil add onions and cook over medium heat until soft and transparent add ground beef continue cooking until browned. Drain fat. Stir in the ketchup, brown sugar, mustard and Worcestershire sauce. Remove from the heat; set aside. Bake at 400° for 14-16 minutes or until golden brown. Freeze option: Freeze cooled pastries in a freezer container, separating layers with waxed paper. To use, thaw pastries in the refrigerator for 8 hours. Reheat on a baking sheet in a preheated 375° oven until heated through. Can also be reheated in the microwave. For added spice add a little bit of Sriracha or other hot sauce.